atagonia is one of the most worlds' renowned places for fly-fishing. 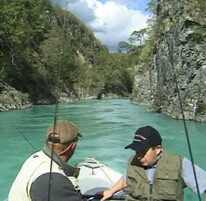 Around Bariloche, are numerous lakes and rivers for fly-fishing. Fly-fishing is possible between November and May. A large variety of trout and salmon weighing up to 30 kilos can be found. Many specialised guides know the best fishing places and wonderful locations including overnight stay in lodges, estancia's or four-star hosteria's. Fishing trips include a guide, fishing equipment, accommodation and meals.